The North Shropshire BKA Asian Hornet Action Team can assist with local requests for help in identifying Asian Hornet sightings, nest sites etc.. 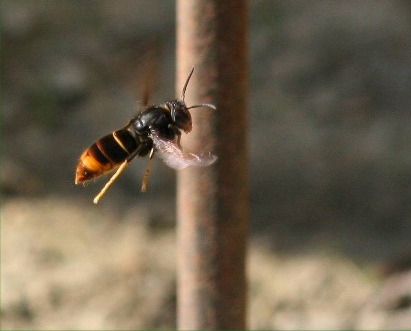 If it is possible and safe to do so try taking a photograph or even trapping a suspected Asian Hornet. However, do not under any circumstances disturb or provoke an active hornets’ nest. The Asian hornet is not native to the British Isles, it is an invasive species. This means that it does not have any natural predators here that would normally control its numbers and our native species are not adapted to coupe with its presence. When it comes to the honey bee, asian hornets when they have discovered a bee colony will then often arrive in numbers to take advantage of this easy food source. The large number of honey bees being lost will quite quickly disrupt the flow of pollen and nectar into the hive. The loss of bees and the reduction in food coming in can then lead to the starvation and death of young bee larvae, the queen bee in turn will reduce her egg laying. In this way the colony can soon go into decline with aging bees dying off and no young bees to take their place, leading to insufficient bees to carry out basic colony tasks. The weakened colony will become vulnerable to disease and robbing and if they survive will probably not be strong enough to survive winter.